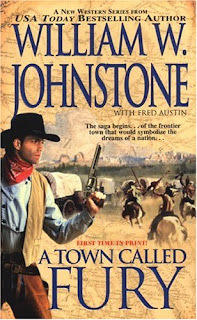 A Town Called Fury is a series of (currently 3) western books written by an anonymous author (or authors) writing under the name "William W. Johnstone With J.A. Johnstone." The first novel was published by Pinnacle (an imprint of Kensington Publishing Corp.) in July 2006 but with the co-author listed as Fred Austin (see the cover to the right). It was subsequently released with J.A. 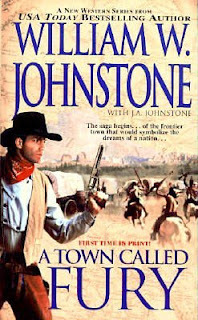 Johnstone as the co-author (see left cover) probably to better build the Johnstone brand since William Johnstone died in 2004. It appears that all new Johnstone books are now being released in this manner. I recently read Hard Country, the second in the series. The first one, A Town Called Fury, is reviewed at Western Fiction Review. The third book is Judgment Day. While the story telling is solid, there is nothing particularly grabbing about the plot. Some feuding, gunfighting, a group of bandits abduct some ladies in the town - including the Marshall's girlfriend as well as his younger sister - and a posse heads out to rescue them. Some nice action, but not a lot of depth to the characters. Like the reviewer wrote at WFR, it "didn’t offer anything new to the seasoned western reader." However, if you like light fast-paced fare before bedtime, this book answers the call. And since I got the book through BookMooch it was worth it. I'll probably mooch the first and third books in the series eventually, just so I can catch more of the back story and find out what happens next. And really, that's all a publisher wants - enough interest in a series so a person goes out and buys the next one. Now I did enjoy the first book in Sidewinders (another 3 book series). The two heroes in this novel have character and the story is a bit more complex. Will have to get the second and third books in that series as well. Once my night stand clears! Note: I also see now that J.A. Johnstone is releasing his first book without the imprimatur of ('uncle') William. The Loner is reviewed here. Good review. Yes, I'm positive J. A. Johnstone is at least three different writers. I read all titles under the William Johnstone name and beleive I can detect three styles.